^ Hugman, Barry J. (编). The PFA Footballers' Who's Who 2010–11. Edinburgh: Mainstream Publishing. 2010: 15. ISBN 978-1-84596-601-0. ^ 2.0 2.1 Agger official profile. Liverpool F.C. [8 July 2011]. （原始内容存档于2011年6月29日）. 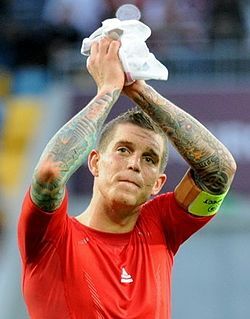 ^ Defender Daniel Agger signs Liverpool contract extension. BBC Sport. 2012-10-05 [2013-02-05] （英语）.